Common Loon with Young, Owen Gromme. Recently, I saw my first Loon. This is a bird I have been watching and waiting to see for a long while. A few months ago, I began to wonder if I hadn't seen it, in fact, but not known it. I don't know how other people use their field guides, but I have always examined every page- even the pages on birds and flowers and trees and rocks that are not in my locale. I rate the pleasure of leafing through field guides very highly. Do you remember, perhaps, the Sears Christmas Catalog? With many pages of toys to admire and lust after? The bird field guide is a little like that. I love the drawings of the birds in flight, the close ups of lores and special distinguishing details, the maps, and descriptions of the calls, too: whe-ooo quee and hoooo-lii. I have pored over the birds even before I find, sight or identify them. 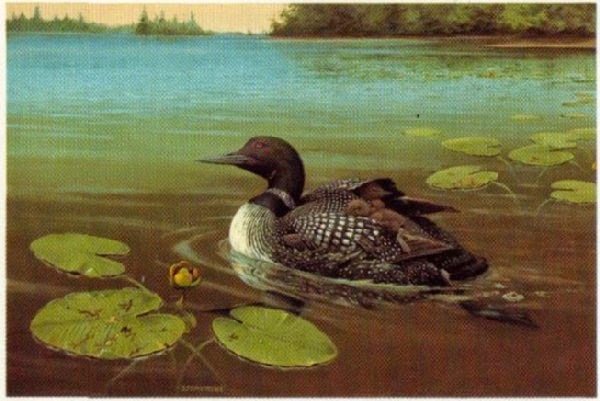 The Common Loon is one I have studied often in the guides. Now, to have seen one, I hope you will join me in celebrating the sighting, by sabering some Champagne. If a saber isn't handy, we can just open it in the usual way. Loons have some curious adaptations to their diving ways- they have solid bones, and they flatten their plumage, pressing air out to decrease their buoyancy for diving in pursuit of small fish. They are also able to conserve oxygen by slowing their heart rate underwater. Loons are fast fliers- up to 70 mph. They need at least 30 yards of open water to run across to become airborne- they are unable to lift off of the land. They come ashore to nest and hatch their eggs, but they must waddle back to the water in order to fly. But these are mere facts- the Loon is more than these. It is the suchness of it I would like to express. It seemed solid, and not made of individual feathers, and the patterned markings were so lovely. It had scrabbled up a bank, and it lay in a heavy heap at the end of its track through the dense mud. It turned its eye towards us, but made no sound: Hear them here. See how it got its white necklace, in this charming film utilizing Native American masks to tell the traditional story. May you also find a Loon to admire one day soon, as Mary Oliver does below, in her poem The Loon.